The Americana Project is an innovative music and arts education program with broad community outreach. 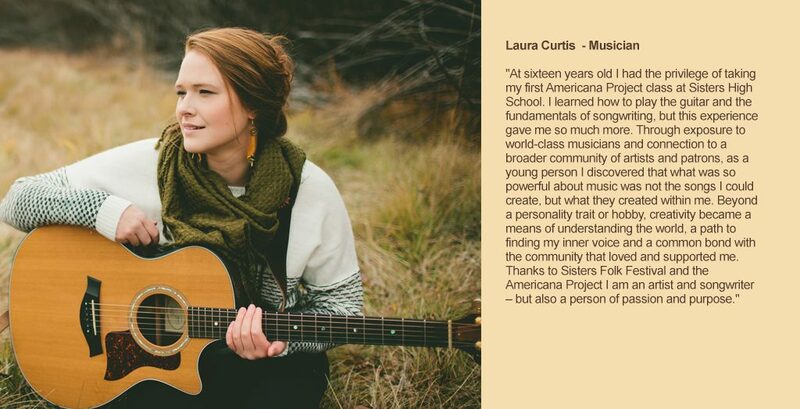 It is a collaboration between Sisters Folk Festival, Creative Educational Resources, and the Sisters School District. Classes each day at all three Sisters public schools provide opportunities for self-expression in music and the visual arts. Students learn to play guitar, write songs, perform, record and engineer their own music. Through the Community Luthier program, students learn to build custom guitars and ukuleles.Young people in Sisters are mentored by national, regional and local guest artists. Great insight is shared on life as an artist, from business practices in the arts to job opportunities. Through their exposure to guest artists, the luthier program, and participation in My Own Two Hands, students expand their thinking to see the arts as a lens through which to view their lives. Through our fundraising efforts, students receive scholarships for continuing education opportunities in the arts. Students learn to serve in the community by volunteering at Americana Project events, an important component of their experience in the program. Read the article below about the science behind the benefits of music education, another important reason to include it in our schools!